It’s like watching a good friend light up another cigarette. In your heart, you know it’s nothing more than an ugly method of slow suicide, but you also understand that he’s completely addicted to the process. So as you sit there, the question becomes, at the risk of concerned overtures being perceived as incessant nagging, which is never an effective tactic, do you point out the folly of his deleterious ways in hopes he’ll finally give it up, or do you simply keep your mouth shut? Clearly, I fall into the former group which may well explain my vast popularity. So even though my attempts to enlighten my newspaper brethren have clearly crossed that carping threshold line, and there really isn’t all that much hope left at this point, I refuse to stay silent because local newspapers’ survival is far too important. While zipping through the main section of the Sunday Tribune, much like the late Clara Peller, I found myself suddenly shouting to no one in particular, “Where’s the beef?” The paper started off well enough with a great headline story on Bruce Rauner’s rapidly fading electoral hopes, but then the rest of it broke down like this. The two remaining front page pieces were medical stories. There’s anything wrong with medical stories, but unless you’re covering a cure for cancer, they clearly belong in the magazine or features section. Neither one had anything to do with Chicago either. Page two provided yet another opportunity for John Kass to go off of on the President. Apparently he doesn’t think his 739 previous pieces on the same tired old subject have had any effect whatsoever. Yes John! We get it! Barack Obama is the very embodiment of the Anti-Christ. So now can you finally write about something else? Then, to cap it off, Mary Schmich’s page three column considers a quandary that weighs heavily upon all our shoulders – whether or not to publicly shame a public park smoker. Personally, I’d be a little more concerned with keeping the bullets, drugs and wilding mobs out of Chicago parks. Call me crazy, but if cigarette smoke is the worst thing you have to contend with, you’re way ahead of the Chicago curve. Only the article on the lingering toxic tank rail car threat was a real Chicago news story and it was kinda buried! It’s not that some of the other pieces weren’t newsworthy. But again, a charity event, a teen founded website for the mentally ill, first ladies’ role in presidential libraries, and a family squabble over a Skokie photographer’s legacy all belong in the magazine or Lifestyle section. Where’s the inside look at mayoral challenger Bob Fioretti? Rick Pearson would do a phenomenal job on that one. Where’s the story on Rahm’s reaction to his uppity 2nd Ward Alderman challenger? How will Darth Madigan figure into that contest? Bruce Rauner and Jim Oberweis aside, what about all those state rep races? Where’s the story on the new Chicago FBI headquarters follies? How about an in-depth piece on how the CPD’s inability to effectively contend with a splintered street gang structure is the proximate cause of so many murders? They didn’t do any of that, but the Trib did do a page three piece on former South Carolina Governor Mark Sanford’s recent parting from his former Argentinian “soul mate.” For a minute there, I thought I was reading the Enquirer. 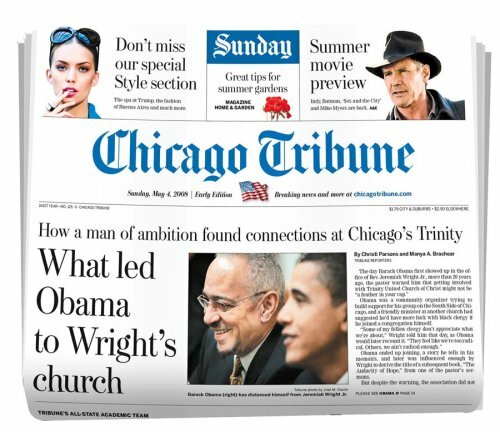 I don’t care what anyone says, the Chicago Tribune is a local newspaper. Their “local” may be a little bit bigger than most of ours, but the bulk of their readers share a common reality. And the one thing for which those remaining print media readers regularly clamor is, hyper-local news. It’s a very simple concept. I’m not saying the Trib shouldn’t cover national and international news stories, but there’s a separate section for that. C’mon! I used to savor the front page portion of that paper and it’s inevitably pithy contents, but now I’m done with it in five minutes. What the bleep happened to the local news? And Mike Royko, who’s doing 3600 rpms in his final resting place, thought Rupert Murdoch was the worst of his worries!